Professional vibrant Colored Cocoa Butters. Use these cocoa butters to create your own unique chocolate candies, confectionery designs and transfer sheets. They can be applied directly to chocolate molds or acetate sheets using a brush, airbrush, power sprayer, even your finger! Cocoa butter must be tempered for proper crystallization and shine. 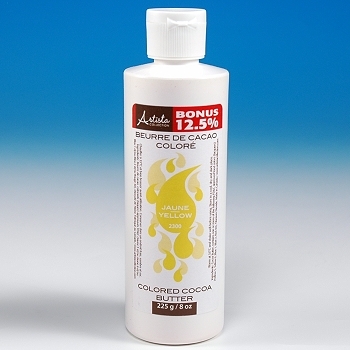 Place bottle in a 110F degree waterbath for about 15 minutes, or until 2/3rds of the cocoa butter has melted inside the bottle. Leaving 1/3 of the core un-melted. Now shake the bottle until the core has thoroughly melted. For brilliant results use at a temperature of 86F degrees.